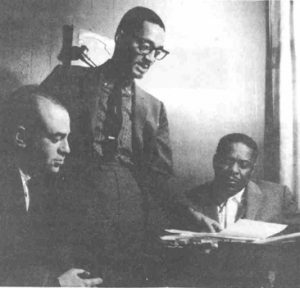 Art was born in Chicago in 1925 and founded Chance Records in 1950. Chance specialized in Blues, Jazz, Doo-Wop and Gospel. Shortly after forming Chance, Art became a behind the scenes partner in Vee-Jay Records and went on to own several jazz clubs on the near north side. The Flamingos, The Moonglows, Homesick James and J.B. Hutto recorded for Chance, and while a part of Vee-Jay, he enjoyed success with Gene Chandler, The Four Seasons, and The Beatles, just to name a few. For the past 30 years, he has lived in Aurora, Illinois while still being involved in the music and real estate businesses. In celebration of his recent 90th birthday, he engaged in an annual skydive in Ottawa … the foot of the Fox River Valley area of Illinois. He recently sat down with the Foundation and talked about his life in music and let us in on some more private parts of his life that will forever remain within the confines of our memories and the walls of the ACTV studio where the interview took place. The music part of his life will be shared with you here at some time in the very near future. Stay tuned! The Fox Valley River Valley of Illinois is rich in Music History. One of the cornerstones of our Mission is to provide Music Education to people of all ages and from all walks of life. To that end, we have created an endeavor that will to do just that … The Living Music History Video Program. 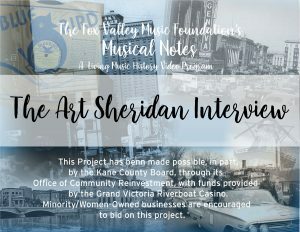 Comprised of interviews of, and contributions from, current, past and perhaps future, significant Fox Valley music personalities, business people, musicians and historians, the program will help to paint the landscape of the Valley’s rich and abundent musical heritage and landscape. The first, of the aforementioned interviews, is currently in the process of being completed as of this writing. Former owner of Chance Records, partner in the Chicago-based famed 1950’s and 1960’s record label, Vee-Jay Records, and former resident of Aurora, Illinois, Art Sheridan, is the subject and star of our first documentary. There are several other similar documentaries in various stages of the production process that will be available during the first half of 2019. The program is brought to you, and made possible, in part, by the Kane County Board, through its Office of Community Reinvestment, with funds provided by the Grand Victoria Riverboat Casino. MInority/Women-Owned businesses are encouraged to bid on this project. The funds obtained from the Grand Victoria Riverboat Fund were used to purchase video cameras for the conduct of the interviews, and editing equipment to produce the documentaries. 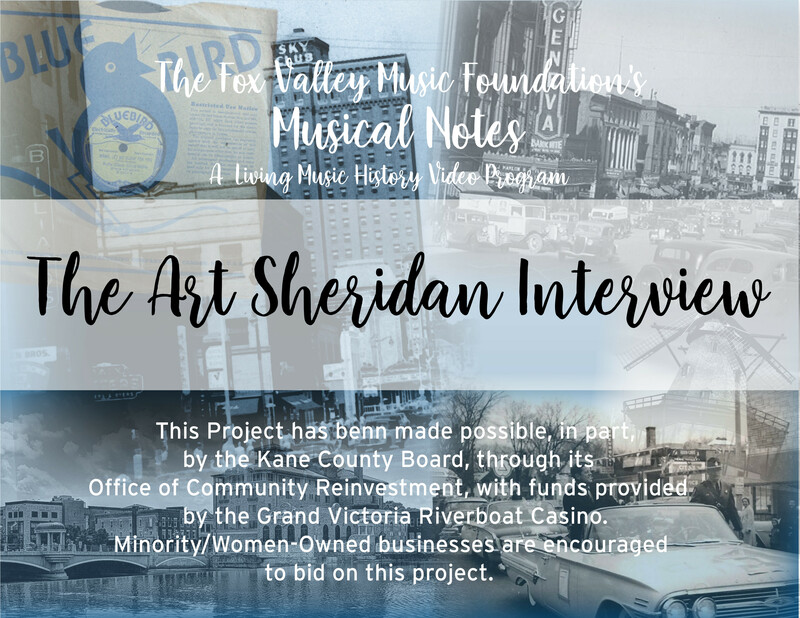 The end results will be posted on the Foundation’s YouTube Channel, broadcast on local cable access channels and will be distributed to Fox Valley area educational institutions for use in music history classes and programs. Stay tuned to our Facebook Page for information regarding the live screening of the Art Sheridan Interview, as well as all of our upcoming screenings, live music events and Foundation activities.